We want to agree with you in your prayers for yourself & your loved ones...prayers for health, wholeness, peace, freedom, joy, & all of the blessings of the Kingdom of Heaven. 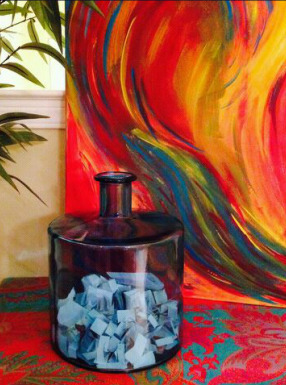 If you specifically want prayer for yourself or a loved one struggling with addiction, let us know, and we'll add their name to the Prayer Jar (see picture). Many of the people whose names are in that jar have already been delivered from the bonds of addiction, and we believe the same can happen for you & your loved one!!! Click/tap below to submit your confidential request.